I went on a bit of a journey with my tag this week! so I resorted to fabrics. but I'm happy with my Pumpkin tag. for the theme of Halloween. Hand embroidered pumpkin on linen scrap with sparkly fiery orange crystals. stem stitch and satin stitch. a quick 30 mins rough sketching whatever came into my head and painting in low light. I like to chop and change medium a lot I feel that this would best describe anything I might add or explore in my book from day to day, week to week. for my vintage photograph album tag. I signed up for the trial subscription of 3 issues of Homemaker Magazine for £6 which sounds like a good deal to me but I was a bit disappointed when I read in the confirmation email that I had missed out on the 1st issue and my subscription would start from the second issue, (wondering if this was a ploy?) anyway so when I popped into the supermarket last night for a couple of things, I bought the first issue. Only halfway through reading it but I like it, beautiful pictures, packed full of ideas and on line info too. I look forward to trying out some of the ideas and using the templates. A few weeks ago, after much deliberation , Kevin decided to make big changes in our back garden. The raised beds at the back of the garden produced such a disappointing crop this year, and some closer inspection also revealed a very large infestation of ants! We decided the space could be put to better use if we moved Kevin's 7x16 foot workshop from the side of the house to the back of the garden. This move would free up the back of the drive and make better use of the garden space. This picture was taken last summer when we had a good crop. and Eco base blocks, now its ready for the move. covered with thick membrane and this lovely golden flint gravel. It just looks so much better don't you think. This weeks theme at Tag Tuesday was Seed Heads. Today I had some fun with fabric and paint. 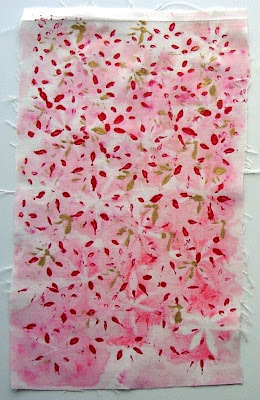 I sketched an outline drawing of a star anise seed pod and placed it over the fabric and then sponged over it with pink watercolour fabric paint. I let it dry and then ironed over it to set the colours. I used this fabric to make my tag, I cut a strip of the fabric when dry and frayed the edges, I then machine stitched it with gold thread to a wider, thicker cream fabric and again frayed away the edges. Star anise and whole cardamoms were then hand stitched in place. I also did a mono print with a darker wine coloured fabric paint on a large white ceramic tile. 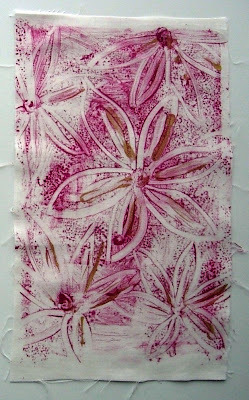 With a small paintbrush I did a quick outline using the Star Anise as my inspiration and took a print with some cream cotton. I went over the outline that was left on the tile with some gold fabric paint in places and placed the same printed fabric over the tile to pick up the gold. Not sure what I will do with it next. for the second week of the Fife school holidays. As promised, here is a little picture of my prayer flags in place, don't they look pretty! Meanwhile Kevin went back home to begin major a workshop move in the garden. On Sunday evening we enjoyed sitting in the awning with the heater on and with Charlotte all ready for bed in her cosy all in ones eating freshly cooked pancakes with butter, lemon juice and chocolate spread...yum! Monday was a lovely sunny day and first thing after breakfast, Charlotte and I set off on our little bike to find the duck pond down at the glen, I'm kicking myself that I didn't put the camera in the bike basket, the cycle down to the glen was quite steep and when we got there the pond was full of ducks and swans all looking for breakfast, some kind people who were staying in one of the chalets backing on to the pond gave Charlotte a morning roll to feed to the hungry flock, she was delighted. After about an hour we headed back up the steep hill back to the caravan. I wasn't feeling too great, a bit out of breath, lacking energy and an annoying cough had started. Harry and I took it in turn to take Charlotte to the park in between reading and eating, I was looking forward to the next few days in the caravan. Back home Kevin and David were getting the workshop dismantled in the dry weather. I have so many pictures taken by David and will have to do a separate post on this. Unfortunately I began feeling quite unwell on Monday during the night I woke up a few times in the night and Kevin decided that as the weather forecast has changed for Tuesday he would come down and stay with us until it improved. Having put a little thought into it I had an idea while packing the van. I quickly printed of a little image onto fabric transfer paper and popped some supplies into my bag. I set to work to make something of it. A rusty nail which Kevin gave me before I left when I asked if he had any rusty things I could use. Kevin arrived in the afternoon. Tuesday night was really bad with both of us feeling really unwell and decided it was time to pack up and go home before we got any worse. I think that was our last trip away for this year in our little Monza. Still trying to get rid of this cough, still keeping me awake at night. with hand written friendship poem I love it Mo thank you! I'm keeping this on as its the first prayer flag I made. All three will hang together in our little caravan. Hark don't you? ...Hark don't you? I really enjoyed working on this little tag which is. Fabric appliqué from my scrap box which I machine embroidered. I added a length of musical ribbon for a tie. 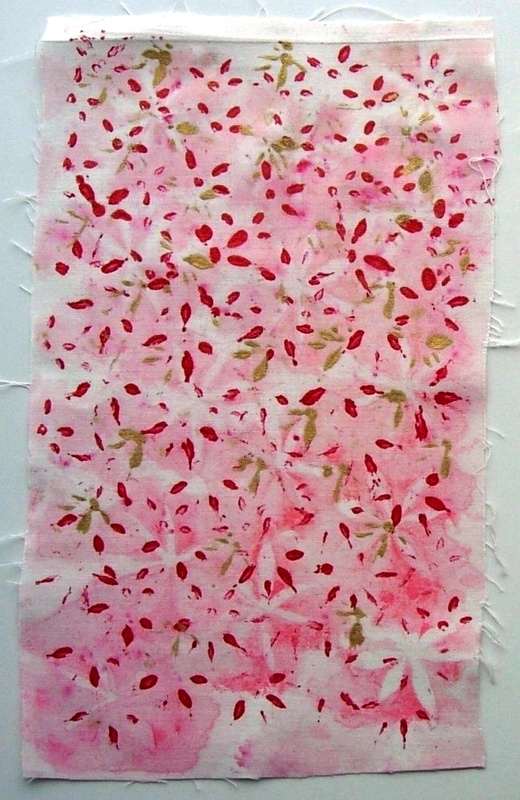 an embroidered leaf stitched on soluble fabric using machine silks and wire. and added a dangle of linen thread which was threaded with a selection of crystal beads in autumn colours and a dyed fabric scrap stitched with the word 'Autumn'. unfortunately it wasn't too long before the ball ended up in the water, poor Charlotte was devastated, no one had wellies on so we had to watch it float away, drifting along sideways until it got caught in the rocks. Lucky for us the tide was going out and soon there would be a walkway over the rocks to get it back. you can see just how much sand has been washed away.